The Jumpoff is a spectacular viewpoint normally reached by a spur trail from the Boulevard Trail, which connects the Appalachian Trail with the summit of LeConte. On August 11, 1984, the Smoky Mountains Hiking Club climbed it from the bottom, out of the heart of the Greenbrier, working around to the side of just enough of the steepest parts that the route didn’t get technical. We followed the Porters Creek Trail to where it ends four miles up. From there the well-known but unmaintained Dry Sluice manway continues, crossing the stream many times as it passes through a garden of rhododendrons, tulip poplars, and hemlocks. When the manway reaches the junction of Porters Creek and Lester Prong, the manway leads to the left to continue up Porters Creek along a faint cairned path, while our group went to the right. Each tributary of Lester Prong leads to a different adventure. The first one leads to the “real” Charlies Bunion. The second leads to the “tourist” Bunion, the one with the little footpath off the A.T. (People may not understand what I mean when I say “leads to the Bunion.” I mean, leads to the bottom of it. Then you climb up the rock spine.) The third tributary—I’ve never been up it, but it would put you between the tourist Bunion and a series of nameless dragon’s-back ridges. On this trip, we stayed with the main stream at all of these junctions until we got to the bottom of the Jumpoff. It happened that we did this hike after a deluge the night before. (I know, sounds like Raven Fork.) We had to wade the manway’s crossings of Porter’s Creek—most of us just went barefoot between the numerous fords. As we progressed up Lester Prong past the 4200 or 4300 foot elevation point, the stream changed its character and became a sluiceway that gouged its way between solid rock walls. We had to do some interesting sidewall maneuvers, looking for toeholds and going sideways. We were now climbing steeply. Around a turn, we came to a giant logjam created by floods. We clambered over, under, and between the heaped-up trees. At the top of the logjam, we could see the stream descending in a series of silver cascades, one after another. We climbed up beside the gliding water, feeling the mist in our faces. Then we angled toward the right and began our 1300 foot climb up a slope upholstered with moss and ferns and pink turtleheads. This was the kind of steepness that somehow I don’t mind because it is so engrossing, where I’m using my hands almost as much as feet and I’m working my way methodically step by step. At some point partway up I saw Charlie sitting under a tree, waiting for his flock to come through, looking like a wise man of the mountains. Clouds had silently swaddled the mountain before we reached the top. We didn’t care about views. We were all hungry. I watched with fascination as one boy opened a can of cold beans and ate out of it with a spoon. Most of us were tired enough that we could have eaten almost anything. Our hike was half over. We still had to descend back into the Greenbrier by a new route that Charlie had scouted on the east fork of the east branch of Porters Creek. We ended up coming down a stream valley that had been completely scoured out by a flash flood just the night before. I’m going to save that description for another post. That night, back at home, I kept thinking about those high cascades, quietly flowing in their secret valley. Flowing right then, as I thought about them. Posted by Jenny in literature, nature, travel, Uncategorized. If your knowledge of literature is good, you will immediately suspect from the words above that I have been reading the novel Lorna Doone by R.D. Blackmore. Yes, it is true. I have been living on the wild, windswept heath of Exmoor, loitering by the fireplace in the cottage of the Ridd family, galloping on my faithful steed along roads frequented by highwaymen, and venturing up the roaring cascades of a hidden stream to visit the forbidden lair of the Doone clan. The book was more of a favorite of my grandmother than my mother. Grandma Johnstone had one of the old-fashioned three-volume editions. She was not in a hurry to finish a book. She loved the leisurely setting of a scene in Sir Walter Scott, the tale that begins with a small figure making his way across a highland glen, or over a pass between precipitous crags, or through whatever mist-swirling, moss-festooned place Scott might have invented. Blackmore was a bit later than Scott, writing Lorna in 1869. But they were cut from the same cloth. Their books were meant to be lived in for a while, as one sat in the parlor in the evening turning the pages, admiring the illustrations, lost in the romance and intrigue. 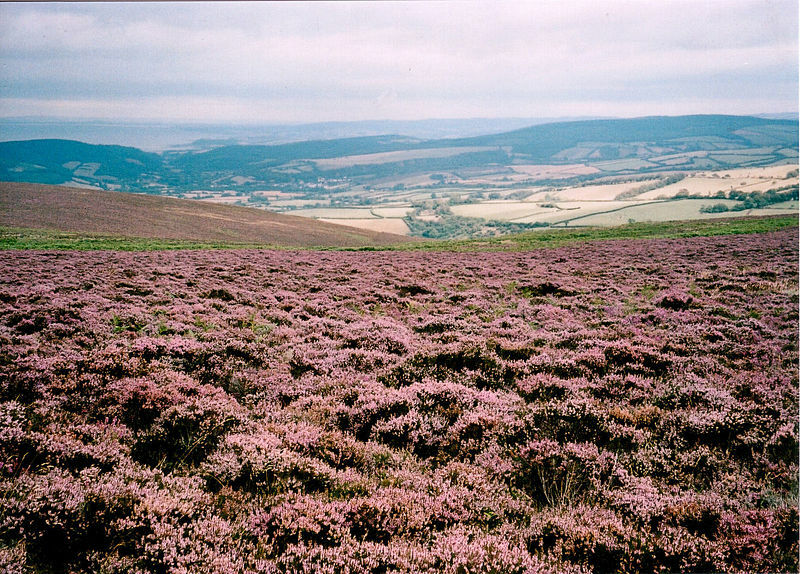 I would like to visit Exmoor someday. It takes its name from the River Exe, and many other streams and rivers flow through it. Most of it is now a national park. Exmoor has the advantage of not being on the way to anywhere else, unless perhaps you are going from South Wales to Cornwall. The area has only small villages. Herds of red deer and wild ponies wander the moors. 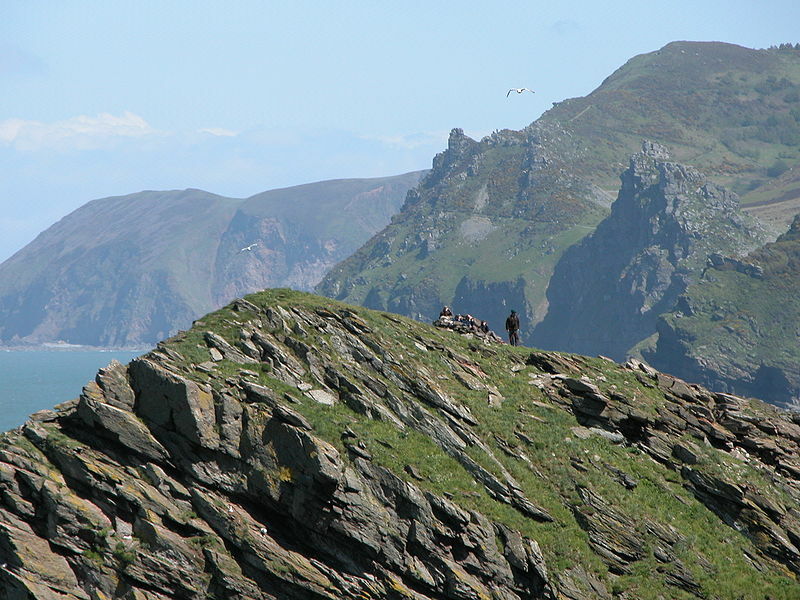 The coastline is embroidered with waterfalls and ravines. There is said to be a “Beast of Exmoor,” southwest England’s answer to Sasquatch, that makes mysterious nocturnal attacks on livestock. Exmoor boasts many species of heather, some obscure lichens and mosses, a high-elevation beech forest, and something called a whitebeam tree. It is possible to walk many miles along the system of public footpaths that are such a wonderful feature of England. Blackmore was writing about a time 200 years earlier than his own, the period of the Monmouth Rebellion, also known as the “Pitchfork Rebellion,” against the rule of the papist James II. It was a harsh time. The bodies of criminals were hung from gibbets as a warning along the highways. Lives were short and often curtailed by violence. Some of the passages in Lorna are written in a dialect as impenetrable to me as Uncle Remus would be to a reader in England. But part of the enjoyment for me is to learn about those lives, the schools that were attended, the food and beverages that were served (the venison and the ale), the conversation that was had in a tavern, the gathering of the villagers, both men and women, to do the work of the harvest. The plot of Lorna is pure rhinestones and moonbeams, but the setting is very real. 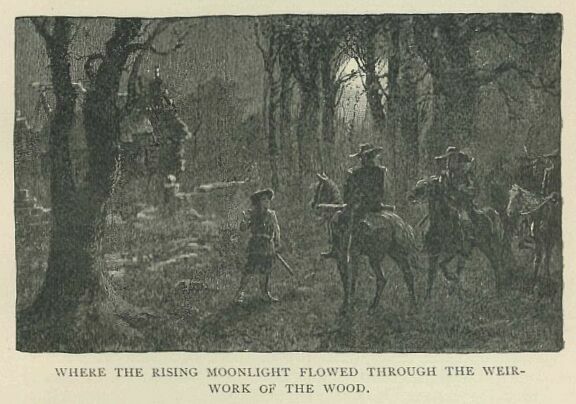 Probably not much had changed in Exmoor between 1685 and 1869. It’s fun just to read the captions to the illustrations. 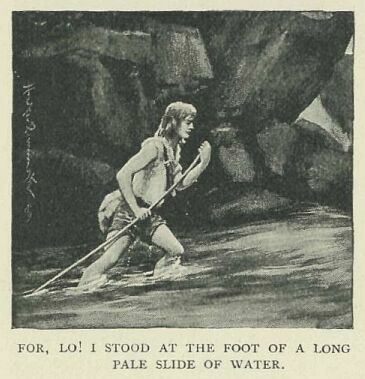 (You can find an illustrated version of Lorna if you go to the Project Gutenberg website.) “I was grieved to see a disdainful smile spread upon his sallow countenance.” “For, lo! 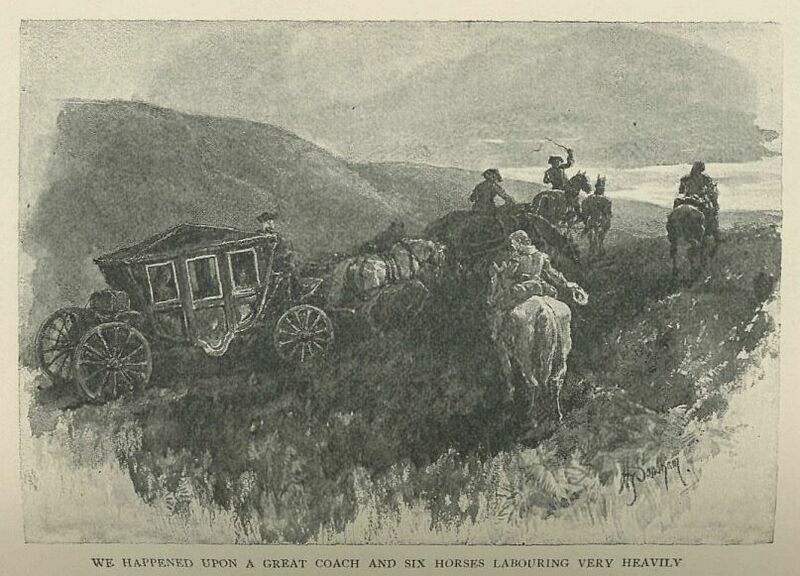 I stood at the foot of a long pale slide of water.” “As snug a little house blinked on me, as ever I saw or wished to see.” “We happened upon a great coach and six horses labouring very heavily.” Ah, wonderful! Since I was going solo midweek and after a lot of new snow, I decided to do a short, easy hike. Chocorua via the Champney Falls Trail seemed like just the ticket. As it turned out, I didn’t even make it all the way to the summit of Chocorua. But it was not a waste of time. I was late getting started (to be honest, I rolled over and went back to sleep when the alarm went off), but I finally galvanized myself for action and eventually set foot on the trail around 10:30. The temperature was around 8 degrees. The first thing I noticed along the trail was that the snow was extraordinarily sparkly. Snow in sunshine always sparkles, but there was something different about this. My theory is that each “snow event” (as meteorologists would say) has a different type of snow crystal, depending on moisture and temperature and wind and all kinds of other obscure meteorological determinants. These snow crystals seemed rather large and very sharp-edged, so that the broad sharply defined face of the crystal really caught the light. At any rate, it was like walking between heaps of twinkling diamonds. Not far up the trail I came across a rather endearing frost creature that I wish I could have taken home with me. It had such beautiful fern-shaped crystals. 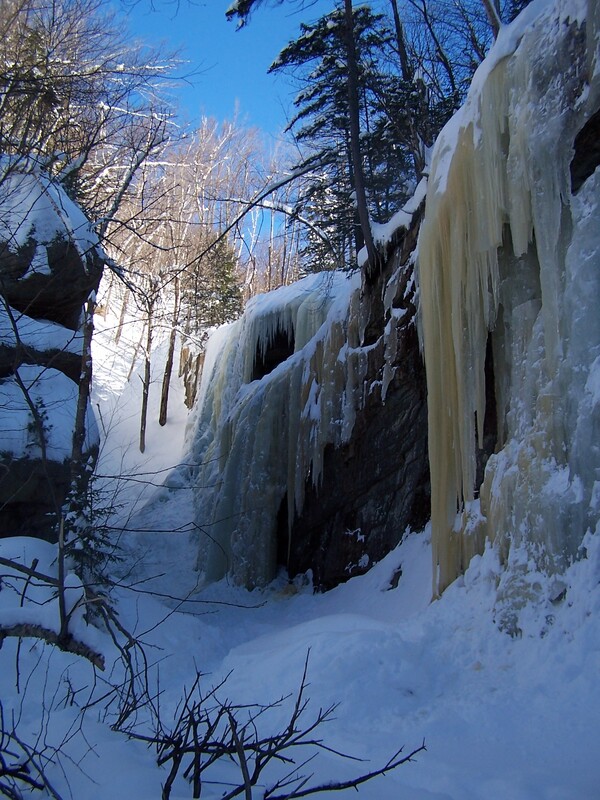 Then I got to the Champney Falls loop trail and dropped down to wander around the falls and the titanic icicles. After I viewed the falls, the first serious hiking challenge of the day presented itself. Getting back up to the trail involved quite a bit of floundering to get past a steep bit with ice underneath the snow, but I didn’t feel like stopping to put on my crampons or microspikes just to get up a short stretch. Eventually I heaved myself past the difficult bit and got back onto the main trail. I’d been bare-booting up to this point, but I could see the traffic had been much lighter above the falls, so I put on my snowshoes. My guess is that one person had gone up the trail on Sunday or Monday, and that there hadn’t been a whole lot of traffic in the past week. There was about 6-8 inches of new snow over the most recent tracks, and the trail seemed a bit too much on the fluffy side—not really what you want in a trail. “Just keep trudging, and you’ll get to the top,” I told myself. After a while of doing this—it was fairly hard work—I thought, “Maybe I’ll just go up to Middle Sister instead of up Chocorua.” I could see both of the ledgy summits above me, shining in the sun. After all, I had been up Chocorua many times, most recently just a few months ago. But when I got to the Middle Sister cutoff, it showed no signs of having been used any time this winter. I felt lazy. I decided to keep going up to what I remembered as a ledgy open outlook. That was at the main junction with the Middle Sister Trail. I could see Middle Sister seemingly just a stone’s throw away, over a (once again) unbroken trail. I stopped and had lunch. Feeling singularly unambitious, I then proceeded back down the mountain. I think I needed someone along with me to egg me along. It was just one of those days when I wasn’t fired up with a “go get ’em” mentality. I continued down past the Champney Falls loop trail, noticing that the trail felt like a sidewalk below the loop compared with conditions above. Eventually I got to the steep little esker covered with hemlocks where the trail climbs up to get out of the narrow stream valley. The trees seemed very beautiful in the afternoon sun. Hemlocks were my Dad’s favorite tree, and I often think of him when I am in a hemlock forest. I stopped and just absorbed my surroundings for a few moments, and I felt that I was communing with Dad, who departed eight years ago. I don’t believe in an afterlife, but I believe that people continue to live on in our memories about them. So I continued down the trail. The sun angle had changed, and all the sparkling crystals had gone to sleep. I ended up quite satisfied with my hike, despite its unambitious nature.